A stunning natural wonder turned useful lighting fixture for your home or office. Each stone is selected for its individual shape, color, texture, and natural beauty. Add beauty to your living space with the these Gemstone Lamps. Valued highly in ancient civilizations, amethysts often represented royalty and luxury. This stone was thought by the ancient Greeks and Romans to prevent overindulgence, and so they often decorated their wine goblets with amethyst gems! On a more metaphorical note, amethyst has long been used to promote "sober" or clear thinking. 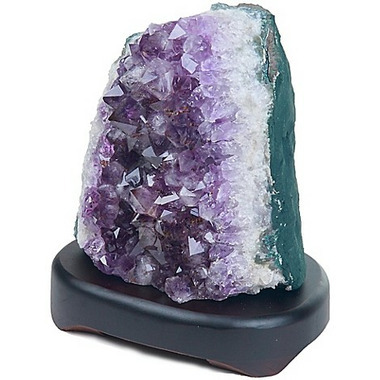 In many cultures, amethyst is thought to provide a connection with the divine, and so it is often used during worship or meditation to help bring a sense of mental calmness and peace. Sometimes referred to as "nature's tranquilizer", amethyst is said by some to help bring relaxation and clear the mind of negative thoughts.